For many faculty members, nothing speaks more persuasively than data. Dean Grasso initiated and worked with the UGA Office of Institutional Research to build a database that would allow UGA faculty to investigate their own programs and compare them to similar programs or to the university as a whole. 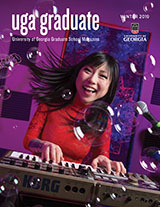 Access is currently restricted to UGA faculty, who must provide their UGA MyID. The database can be found at https://facts.oir.uga.edu/facts/Retention.cfm.